We can increase the flow on some of the top feed and side feed Subaru injectors. The injectors are modified, cleaned, new parts installed, and flow test data is included. Just indicate you would like your injectors modded on the customer information sheet. Be aware that your injector flows may or may not match up closely after being modified, (no matter who does them), that is why we recommend considering purchasing a already matched set... Since they should be grouped by flow characteristics probably from a larger lot of them. Please note: We do not sell matched sets anymore. A lot of "Hacks" are modding these injectors out there with bench grinders and the flows can vary by up to 10%. Do you want to trust your engine to them? Save a few dollars doing that... And it may cost you an engine. It is always wise get a matched set of injectors. It makes the difference between a good running engine and a great one. Replacing any injector with another injector with a different flow requires the ECU to be reprogrammed, please consult a professional mechanic and tuner. Note: Our injectors have been known to outflow most competitor's injectors of the same cc's/min due to our fluid and methods. Flow differences between shops can vary some. Click the link below for the explanation of flow variations. We do not ship outside the USA or it's territories. For shipments inside Washington state, please contact us about sale tax rates before ordering. 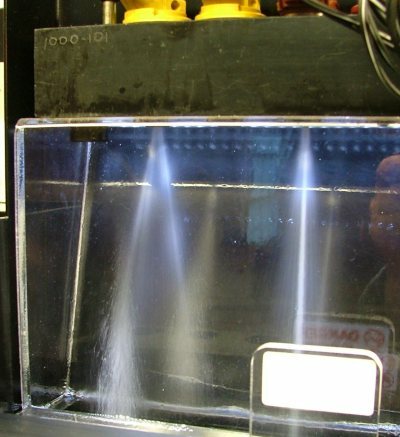 We assume no responsibility on how these injectors are used or damage resulting due their use. Please note that we just remove the difusser plates and there is no guarante of how well the injectors will match, as there is no adjusting the flow after they are modified. So be advised... you get what you get. One possible option is that you send in a couple extras and we will modify them all, send you back the closest four and we will the rest. You pay for only four. Please note that we just remove the difusser plates and there is no guarante of how well the injectors will match, as there is no adjusting the flow after they are modified. So be advised... you get what you get. One possable option is that you send in a couple extras and we will modify them all, send you back the closest four and we will the rest. You pay for only four. This part is just for your information only. Are you having trouble tuning this type injector? Many customers are sending these injectors for cleaning and testing, but we have found most of them are fine and work as intended. These injectors have the part number 2450 stamped in the top plastic. The problem here is that they are are a 17+ year old Denso design that were intended to be used as the for the 93 to 95 Mazda RX-7 turbo engine. It was a secondary injector that only operated during full throttle and high RPM conditions. It was never even operating during idle in the RX-7. These are now being sold by some people as a WRX injector upgrade, but it's the same old technology injector with a spacer and different o-rings.They were not designed for use in a multi-valve new OBD II system. 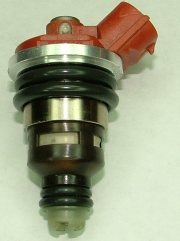 The stock yellow topped side-feed injector has the V shaped pattern on the left and the Denso (RX-7) injector on the right has a very narrow stream that causes idle and light throttle issues. Due to the high coil resistance and heavy pintle design, they are very slow and that is causing misfire codes. Also their shorter length and non-stock two lower o-ring setup may not seal in the rail correctly. One interesting fact about this Denso injector that very few people know about... They will flow more the longer they are used. This is one of a handful of injectors that exhibit this behavior. We have observed up to a 10% increase in flow in older, high mileage ones. Probably best to leave them for use in the old RX-7's. Just some factual and hopefully useful information. They are a fine injector.... for an old OBD-I rotary engine, just not for the OBD-II Subaru's. Best to use a matched set of modified yellow topped side feeds. They will drop in without changing the connectors and be easier to tune.